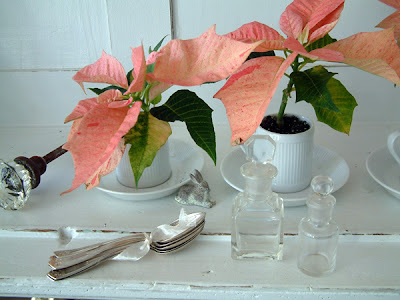 These poinsettias are the smallest in the world; they are lovingly referred to as "pixies" in the poinsettia industry. They are only available at Fisher and Page in the flower market, I know because the gentleman who runs plants there told me twice. Sweet things, aren't they? Anyway, I'm off to 28th street again this morning, this time in search of white ones. (The plants pictured here are hybrids...so pink.) The pleasure of perusing the plant stands (as opposed to cut flowers) is they are open later, and the rush to get there at 6 am is moot. I may or may not also stop into the biggest store in the world.